The Seahawks lost kicker Sebastian Janikowski for the second half of their playoff game against the Cowboys after he came up wincing on a 57-yard field goal miss. ARLINGTON, Texas — A 57-yard field goal attempt on the final play of the first half seemed like a good chance for the Seahawks to steal some points and head into the locker room with a good little boost. Instead, it turned into a serious injury for kicker Sebastian Janikowski and forced Seattle to change how it approached the final two quarters of Saturday’s 24-22 loss to Dallas in a wild-card playoff game. Janikowski came up limping after his 57-yard attempt, which went wide right. There was no reason to think Janikowski couldn’t make it — he hit a 56-yarder at Chicago in a similar situation earlier this year, and this time had the advantage of the controlled conditions of Jerry World. But Carroll said Janikowski — who turns 41 in March — just may have tried a little too hard. Dickson took a couple of attempts during halftime to try it out, one missing badly. But Carroll said Seattle’s general game plan in the second half was to avoid any kicking, if necessary. Seattle went for two after each of its two second-half touchdowns, and got each one on runs by Chris Carson and Mike Davis. Seattle also went for it on a fourth down at the Dallas 40 late in the third quarter, picking up the conversion on a Wilson pass to Doug Baldwin. Had Seattle won, the Seahawks would undoubtedly have needed to sign a new place kicker. The Seahawks may well be in the market for a new one, anyway. Janikowski signed a one-year deal with Seattle this past offseason and will become an unrestricted free agent. That, plus some health issues — he also hurt his back in a game two weeks ago against Kansas City — indicate that the Seahawks will likely explore other options. 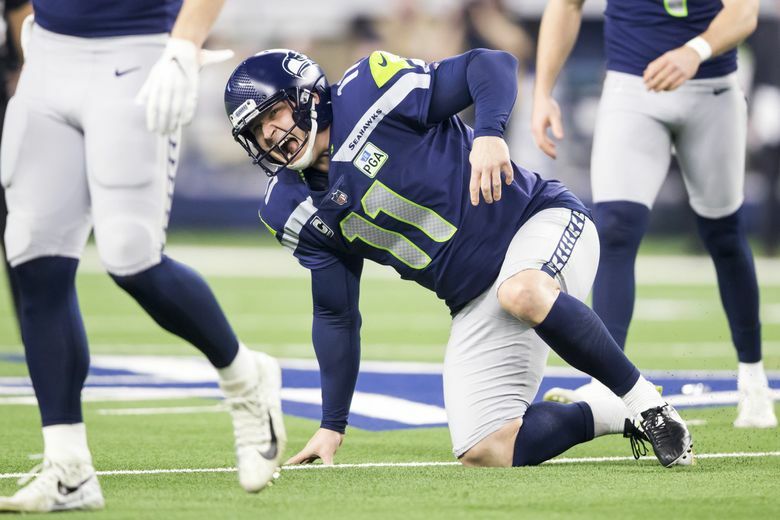 The Seahawks may be without K Sebastian Janikowski for the rest of the game, which would make P Michael Dickson the field goal kicker.